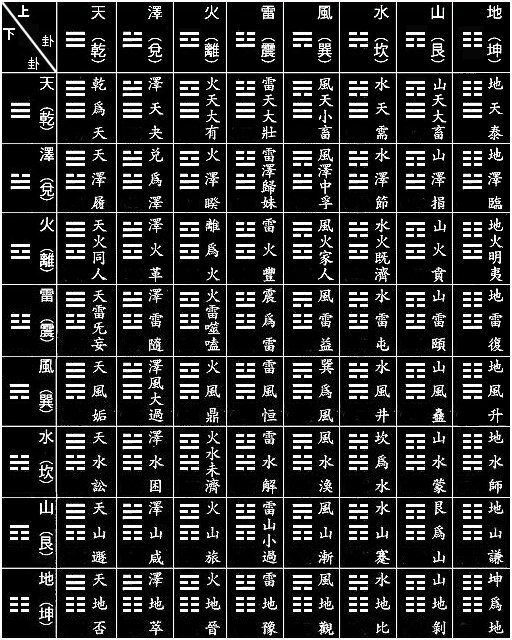 This canonical book contains 64 generally called hexagrammes figures because they are formed by six interrupted lines (阴 Yin) or full (阳 Yang). These hexagrammes 64 represent all the possible situations of beings during the changes of the universe. The essential movement 易 I shows itself in the 太极 Taiji ( Supreme Summit) according to two modalities 阴Yin et 阳 Yang. The Yin is the rest, the ground, dark, feminine, passive aspect. it is represented by an interrupted line - -. The Yang is the activity, the heavenly, brilliant, male aspect. It is represented by a full line -. They are the two 仪 Yi generally and rather improperly called "principles". The two Yi engenders four 象 Xiang. Two of them are obtained by adding a line Yin under each of the two Yi. They are = = 太阴 Taiyin and 少阴 Shaoyin. Two others are obtained by adding a line Yang under each of the two Yi. They are 少阳 Shaoyang and == 太阳 Taiyang. The order Taiyin, Shaoyin, Shaoyang, Taiyang, obtained since the genesis of the four Xiang from the two Yi, is the logical abstract order going of the highlight from the Yin to the highlight of the Yang. These four Xiang represent the aspects of the universe in movement, the continuum space-time. We arrange them according to the concrete cosmic order. Shaoyang represents the fire, the rising sun, the East, the spring. Taiyang represents the sky, the sun of noon, the South (warmth), the summer. Shaoyin represents the water, the declining sun, the West, the autumn. Taiyin represents the earth, the setting sun, the North (cold), the winter. This order represents the ascent and the decline of the vital power, concentrated in the sun and symbolized by him. The four Xiang engenders eight trigrammes or八卦 Bagua. Four of them are obtained by adding a line Yin under each four Xiang. They are 坤 Kun 艮 Geng 坎 Kan 巽 Xun. Four others are obtained by adding a line Yang under each four Xiang. They are 震 Zhen 离 Li 兑 Dui 乾 Qian. The order of eight trigrammes engendered from four Xiang is the logical abstract order going from the highlight of the Yin to the highlight of the Yang. If we reverse it, we obtain the logical abstract order from the highlight of the Yang to the highlight of the Yin. Leibnitz recognized that the figures of the Book of the Changes, based on the different combinations of two elements - - and -, suggested him the system of binary calculation (dyadique system), based on two elements as 0 and 1. The mathematical order so obtained corresponds exactly to the logical order Yin-yang of eight trigrammes engendered from four Xiang. Eight trigrammes represent exactly the aspects of the universe in movement, the continuum space-time. We arrange them according to the concrete cosmic order. It is the order traditionally attributed to 伏羲 Fuxi. This order goes from the beginning of the increase of the activity of the Yang to the highlight of the Yang, then follows the decrease of the activity of the Yang until the highlight of the Yin. This order is such of the last four trigrammes of the logical order Yin-yang followed by the last four trigrammes Yang-yin. The logical abstract order represents a continuous growth. The concrete cosmic order represents the appearance, the ascent, the decline and the disappearance of the vital power concentrated in the sun. It is the representation of the concrete cycle of the life. The Eight trigrammes, by harmonizing two by deux, engender (8x8) the 64 hexagrammes. There are various possibilities of consulting these combinations ending in different orders which can serve, in turn, to analyze the multiple relations of hexagrammes between them. We can elaborate the figures of 64 hexagrammes not by combining different manners the eight trigrammes, but by adding lines one by one. We establish a general division between the side Yin and the side Yang. The elaboration of the 64 hexagrammes by lines can be made according to another method. We start with the two Yi. We add alternately a line Yin and a line Yang over each of them. We obtain four Xiang. Again we add a line Yin and a line Yang over each of them. We obtain eight trigrammes arranged according to the logical order Yin-yang. The 周礼 Zhou Li (The Rites of Zhou) declare that the Great Soothsayer (太卜 Taibu)is in charge of (三易 San Yi), three systems of the Changes called 连山 Lianshan, 归藏 Guicang, 周易 ZhouYi. At the time of the Eastern Han, the commentator Zhengxuan explains that the first system, used under Xia, began with the hexagramme Geng, consisted of trigrammes two Geng represents the mountain, and was called Lianshan " Chain of Mountain "; the second system, used under Shang, began with the hexagramme Kun, consisted of trigrammes two Kun representing the earth, and was called Guicang " Return under cover " of the mother Earth to whom ten thousand beings return; the third system, used under Zhou, began with the hexagramme Qian, consisted of trigrammes two Qian represents the sky and was called Zhouyi, " The Changes of Zhou ". We found no track of the trigrammes or hexagrammes in the registrations on shells of tortoise and bone of the end of Shang. Hexagrammes was more late elaborated under Zhou. The first very brief explanations were followed by comments which increased gradually during ages. They are 十翼 Shiyi (Ten Wings), Two 彖传 Tuanzhuan, Two 象传 Xiangzhuan, Two 读传 Duzhuan or 系辞传 Xicizhuan, 文言 Wenyan, 说卦 Shuogua, 序卦 Xugua, 杂卦 Zagua. The development of the speculations brought different reorganizations of the order of 64 hexagrammes. The current order, traditionally attributed to Wenwang, king Wen of Zhou, manifestly takes place and does not correspond any more to the original order. For the interpretation of hexagrammes, it is necessary to refer to the logical order, mathematically verified, who indicates in a exact way the proportion between the action of the Yin and that of the Yang, and to the cosmic order based on the primitive order (attributed to Fuxi) the eight trigrammes (these coated arranged, for the needs of the speculation, according to different orders). 4. Comparative table of the 64 Hexagrammes.